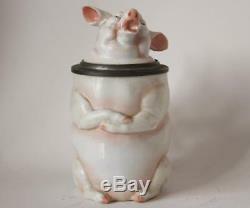 Antique German Porcelain Character Beer Stein Singing Pig by Schierholz c. This very interesting German porcelain beer stein belongs to the family of character steins - steins made in a shape of an object or person. They are also called "figural". This particular one is made in a shape of a pig - crossing its upper feet and singing. Traditionally, a pig was a symbol of good luck in old German animal symbolism. Cats represented hangover, monkeys represented drunkenness and owls represented wisdom. All of the animal shape character steins did have a special meaning to them. 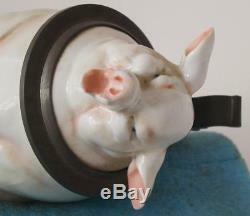 This pig stein was made by Schierholz in two varieties - singing and smoking a pipe - two very popular activities in old Germany, - with the same body and different heads. It was manufactured by C. Schierholz & Son - the biggest name in character stein production around 1880 - 1900. The variety of character steins - probably the best character steins ever made, - were created by Edmond Haase, a prominent artist who worked for Schierholz from 1884 till 1900. Over the years he produced many beautiful and famous character beer steins that are highly sought for by many collectors. 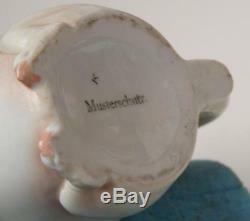 Marked with stamped "Musterschutz" which means the design was protected under the German law. This particular green ink stamped mark is the Schierholz identifier. The stein is in excellent condition with no lines, breaks or repairs. The stein is 7 tall, 0.5 L capacity. Year: early 1 890 s.
Auctiva Offers Free Image Hosting and Editing. 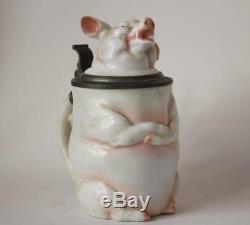 The item "Antique German Porcelain Character Beer Stein Singing Pig by Schierholz c. 1890" is in sale since Sunday, October 8, 2017. This item is in the category "Collectibles\Breweriana, Beer\Drinkware, Steins\Lidded Steins\Germany". 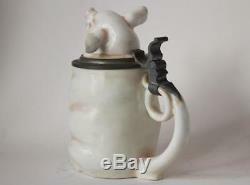 The seller is "beer-stein" and is located in New York.